She followed him because she loved the treasure. She heard him speak of what he had found, and a passage in her own heart opened up. They had found the same treasure in different caves, and they would share it with whomever they met in that sacred place below the surface of life. 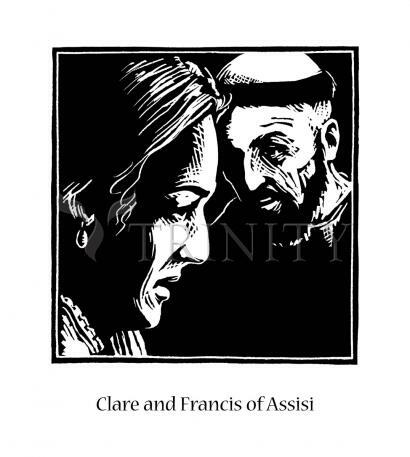 She was Clare and he was Francis, and together they would show the world its hidden heart. ——r. Murray Bodo, OFM, Clare, A Light in the GardenClare…was the first flower in Francis' garden, and she shone like a radiant star, fragrant as a flower blossoming white and pure in springtime. Their feast days are August 11 and October 4. Son of a rich cloth merchant. Francis had a misspent youth. He was a street brawler and some-time soldier. During an imprisonment in Perugia, he had a conversion experience, including a reported message from Christ calling him to leave this worldly life. Upon release, Francis began taking his religion seriously. He took the Gospels as the rule of his life and Jesus Christ as his literal example. He dressed in rough clothes, begged for his sustenance, and preached purity and peace. He visited hospitals, served the sick, preached in the streets, and took all men and women as siblings. He began to attract followers in 1209, and with Papal blessing, founded the Franciscans. In 1212 Clare of Assisi became his spiritual student, which led to the founding of the Poor Clares. Francis visited and preached to the Saracens. He composed songs and hymns to God and nature. He lived with animals, worked with his hands, cared for lepers, cleaned churches, and sent food to thieves. In 1221 he resigned direction of the Franciscans.